Keep-up with the current moves. Capture all the action in the ‘world-of-64’ with news, analysis and commentary by masters of the game. 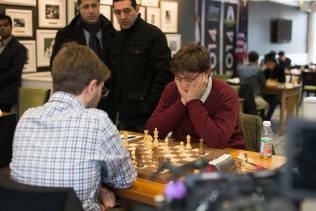 Former ACA student Sam Sevian has just become the youngest American Grandmaster after winning four consecutive games in a round robin GM Invitational tournament held at the Chess Club and Scholastic Center of Saint Louis. ACA coach Andranik is also participating in the event. You can see the games and standings here. Another former ACA student and Coach Armen’s current student, Michael Brown, earned his first IM norm in the concurrently running IM Invitational. You can see the young man’s impressive results and games here.